Following on from the numerous excellent individual results as reported by Paul Jenkinson, the team results were superb! The Senior Men, Senior Ladies and Ladies Masters teams were all 1st and the Male Masters team was 2nd! Hope this bodes well for further success in the NW Cross Country League, though we might be a bit thin on the ground for this Saturday! Please get in touch if you are able to come and run to support your club at Lilleshall or Oswestry, the following Saturday (Feb 7th). Free bus going to both! 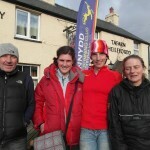 Eryri ar y blaen yn Hanner Marathon Llwybrau Coed y Brenin. Ras llwyddianus iawn wedi ei chynnal gan Matt Ward a chriw ‘Run Coed y Brenin’. Math Roberts yn dod yn gyntaf yng nghategori agored i ddynion mewn amser o 01:25:00 a Dyfed Whiteside Thomas yn y categori V40 mewn amser o 01:33:49. O ran y gwobrau eraill (rwyf yn cofio!) roedd, Victoria Walls (Spectrum Striders RC) merch cyntaf yn y categori agored mewn amser o 01:44:50 a Dic Evans (Cardiff AC) yng nghategori V60 mewn amser o 01:58:02. Tywydd yn braf iawn a dim gwynt na glaw ag awyrgylch hwyliog a chyfeillgar. Eryri on form in the Coed y Brenin Trail Half Marathon. 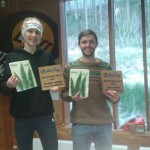 Well organised race from Matt Ward and the ‘Run Coed y Brenin’ crew. Math Roberts came first in the open male category in a time of 01:25:00 and Dyfed Whiteside Thomas in the V40 category in a time of 01:33:49. In relation to the other notable winners (that I can remember!) 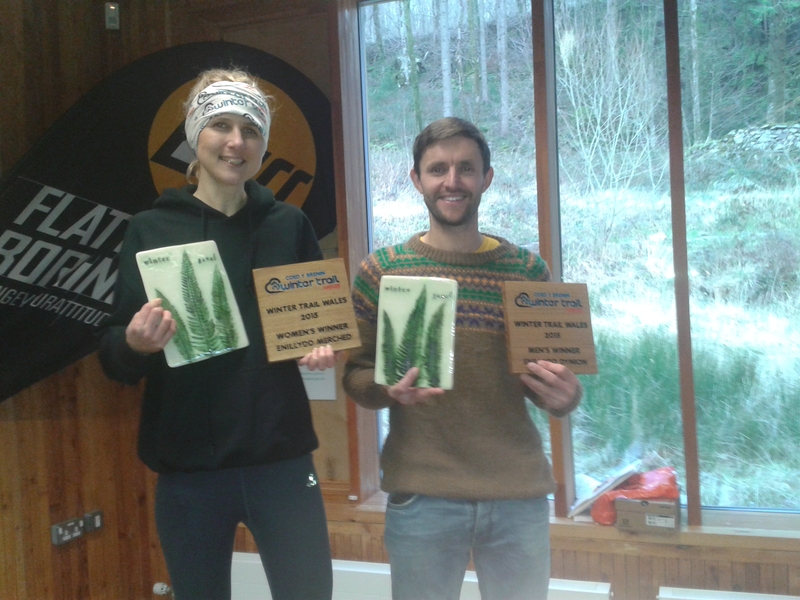 first open lady was Victoria Walls (Spectrum Striders RC) in a time of 01:44:50 and Dic Evans (Cardiff AC) in the V60 category in a time of 01:58:02. Great weather conditions and friendly atmosphere throughout. Minutes from the committee meeting held in December. 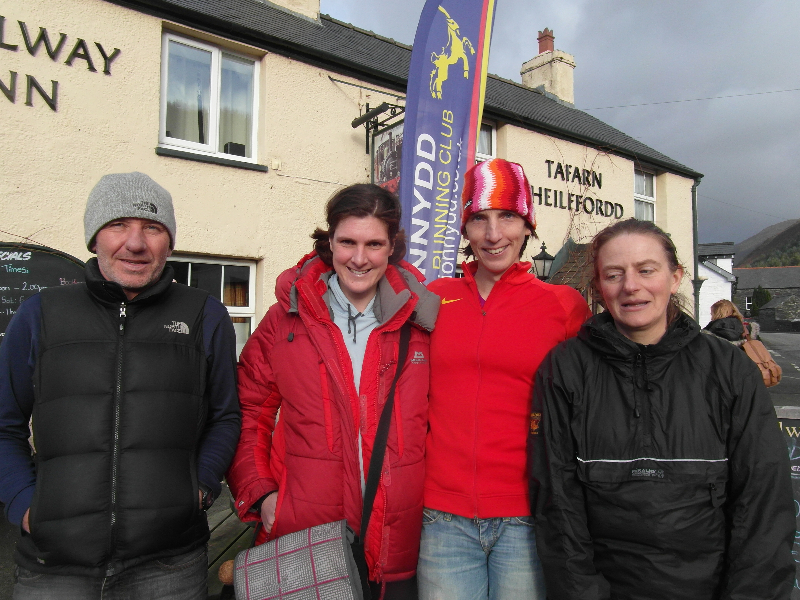 With more races than you could shake a stick at yesterday (Saturday) it was disappointing that fewer than 50 runners turned out in fine conditions at Tarren Hendre. With a comfortable win for Aberystwyth’s Felipe Jones in 50.49, a fine run to 8th place o/a by Lauren Jeska gave her the win on her debut race for the club in 59.06, Ruth Metcalf 22nd, and 1st F40 in 68.45 and Jenny Williamson 34th in 82.52 comfortably gave the ladies 1st team while the sole Eryri man running Mike Belshaw 11th in 60.28 took 1st M50. Despite the obvious clashes with other fine races in north Wales plenty of Eryri harriers were in action at Northop in the North Wales Cross country championships. With more reasonable weather than last year some fine results were achieved. Andrea Rowlands was second lady and 1st vet 40, Bronwen Jenkinson was fifth lady and 1st under 20, Megan Hughes was second vet 35 , Sandra Rowlands was second over 45, Ellie Salisbury was third over 50 and Maggie Oliver second over 65. In the mens race John Spill was third in the under 17 race with Steffan Williams continuing to improve a little further back. Don Williams was crowned over 70 champ, SPJ the over 60 champ, Arwel Lewis over 55 champ, Owen Roberts won the u20 mens race while Daniel Kashi was second male overall and Hugh O’Donnell was second over 35. Thanks to David for giving out so many prizes even if the prize giving took longer than the mens race! 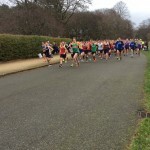 6 Eryri Harriers competed in the 3rd race of the Borders Road Running league 2014/15 Season at Birkenhead Park on Sunday 11th January 2015. On a 4 lap 9.10k course around the Park, unfortunately John Spill was forced to pull out on the 2nd lap when well placed due to illness leaving Arwel Lewis to lead the team home in 69th place closely followed by Tony Woodall in 72nd with new club member and Border league debutant Lizzie Irvine, who ran very well to finish 124th overall and 10th female followed by: 259th Don Williams and 310th Roy Jardine. This year’s always popular annual club social and presentation evening will take place at Y Caban , Brynrefail, 7pm on Saturday 28th February. Tickets £10, to include hot buffet meal. Prizewinners and annual awards for 2014 will be presented during the evening. There was a very good turnout from Eryri for the annual Twin Piers 10k race from Llandudno to Colwyn Bay on Saturday 17th January with 15 Eryri Harriers in the top 48 finishers, with 20 overall in the field of 400. 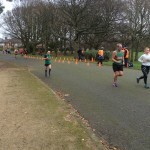 Gwyn Owen beating over 400 runners from pier to pier winning in a time of 33:00 ahead of Prestatyn’s Dean Longley 33:18. Gwyn also led an Eryri 1-2-3 in the Male Vet/35 category with: 2nd Hugh O’Donnell 35:20 & 3rd (making a comeback after a few months away from racing, last year’s Twin Piers race winner) Brendan Rothery 35:47. There was success for Eryri’s women as well, Lizzie Irving was the 1st Senior/Female finisher in a PB time of 41:38 ahead of Bangor Universities Becki Taylor 42:12 with Gemma Morgans 3rd, 42:39. Other notable Eryri individual prize winners: 1st U/20 and 4th overall: Owain Roberts 33:54 (PB). 3rd MV/45 Craig Jones 37:45. 1st MV/50 Noel Craine 38:28. 2nd MV/50 Mike Belshaw 39:09. 1st MV/55 Arwel Lewis 39:04. Spare a thought for SPJ – Steve Jones 25th overall who beat all the MV/55 and MV/50 prize winners but ended up with nothing for 2nd in the MV/60 behind John Higginson!! There was only the one 1st MV/60 prize which was won by an unattached runner in a time of 38:01 with Steve very close behind in 38:07? Louise Emery also won the FV/40 2nd prize. The men’s team title also went to Eryri led of course by Gwyn Owen, Owain Roberts, Hugh O’Donnell and Brendan Rothery. Weather conditions were not too cold, dry with the slight tail wind a blessing! It’s North Wales XC championships this weekend (you can enter on the day if you missed the pre-entry deadline!) and then the following weekend is the penultimate race of the North Wales XC league at the National Sports Centre, Lilleshall. The Senior Men are currently 3rd, the Male Masters 4th, the Senior Women are 1st (!) and the Women’s Masters team is 2nd – we are doing really well, let’s try to keep it going with a good turnout! Arwel has very kindly agreed to arrange a team minibus to Lilleshall and it will be free of charge, but we need an idea of how many people would like a space (so we know what size to get and we can justify getting one) – please let Maggie Oliver know if you are running and whether you would like a space on the bus by Monday next week (26th Jan). The bus will leave 10am from Parc Menai and then stop at Black Cat roundabout and as necessary along A55. The Welsh Cross Country Championships are being held at Rhug Estate, Corwen on the 21st February 2015. It is quite rare for them to be in north Wales and we are looking to encourage as many Eryri members to enter as possible. Details of the event are on the Welsh Athletics website under events. If anyone wants to enter please send your name, date of birth and Welsh Athletics registration number to jenkinson67@btinternet.com and the club will do a block entry. Please ensure you have Welsh eligibility to run – see Welsh Athletics website for further details. Entry fees are £3 per person and will be paid by the club if you pre-enter and run. Details of the courses and race times are all on the WA website.